Spain Park ended Mountain Brook’s amazing 38-game home winning streak last week. Jamal Johnson, left, and Sean Elmore battle for the ball in the Jags’ 66-62 win over the Spartans. Photo by Lee Walls Jr.
Do you think it’s just another routine year for Over the Mountain basketball? If you do, it might be a good idea to take another look. 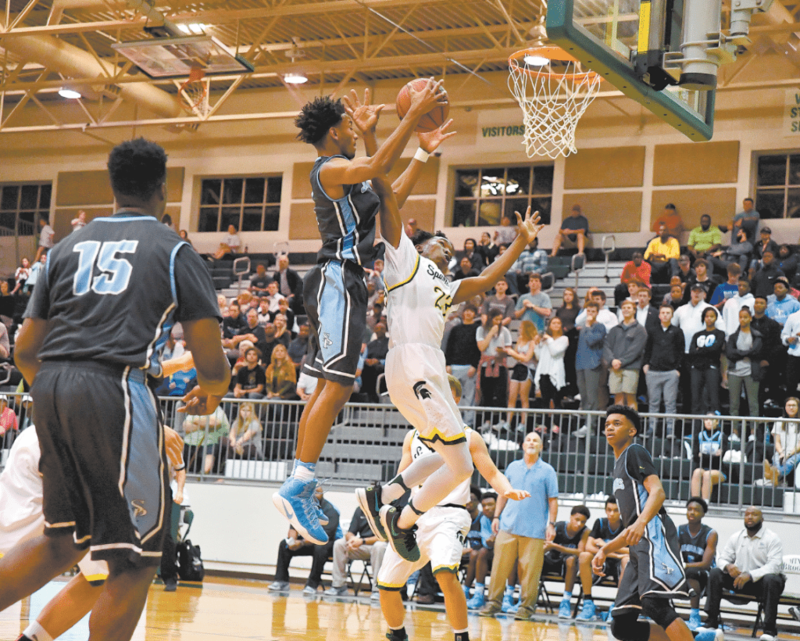 Spain Park’s stunning 66-62 upset of Mountain Brook in boys play last week is a sign that something special may be brewing. The Jags’ win not only ended the Spartans’ amazing 38-game home winning streak, but also offered evidence that after a slow start, Spain Park might be a legitimate contender for the Class 7A championship. Coach Donnie Quinn’s team struggled early in the season, no doubt in large part because of the loss of 6-foot-11-inch center Austin Wiley, who transferred out to a prep school before enrolling mid-year at Auburn University. In recent weeks, Jamal Johnson – who already has committed to the University of Memphis – has stepped up his scoring to offset Wiley’s loss and has helped the Jaguars find their rhythm. Johnson – the son of former University of Alabama star Buck Johnson – scored 31 points and added 12 rebounds in the win over Mountain Brook. For all the hype surrounding Mountain Brook and Spain Park, it might be easy for a casual fan to overlook Hoover, which has quietly put together a 20-4 mark to be ranked second behind Robert E. Lee of Montgomery in the latest Class 7A polls. The Bucs defeated the Spartans comparatively easily in a televised matchup on Jan. 5 and are showing themselves once again to be a bona fide candidate to reach the BJCC’s Legacy Arena in late February – and perhaps go even further. Despite a couple of unexpected losses, Mountain Brook continues to be everything its fans have come to expect in the Bucky McMillan era – a team that plays fundamental basketball with very few mistakes. The difference in this year’s team is the presence of a blue chip major college prospect in sophomore Trendon Watford. Watford scored 34 points in the loss to Spain Park and offers a scoring threat every time his team takes the floor. The Spartans are ranked third in the latest Class 6A polls. Based on its past – and present – Mountain Brook may still be the Over the Mountain team with the best shot at making it to the Final Four. Homewood – the defending boys Class 6A champion – hasn’t turned heads with its overall record, but coach Tim Shepler’s team always finds its game in February. Don’t be surprised if the Patriots make a serious run in the post-season. In girls play, the reemergence of the Hoover Lady Bucs is a significant story. The return of former Hoover star Krystle Johnson as head coach may have been the catalyst to bring the team back to its glory days. Nobody has a better understanding of the basketball culture at Hoover than Johnson, who also played college ball at UCLA and the University of Alabama. Hoover suffered a defeat at the hands of Class 6A’s Homewood earlier in the year, but not many teams in any classification come out of a game against the Lady Patriots with a victory. The Lady Bucs are well on their way to being one of Alabama’s elite programs again. Hoover ranks second in the latest Class 7A poll. Spain Park has also had a strong year in girls play, reaching the number six spot in the poll. Oak Mountain isn’t yet ranked but isn’t far behind. Speaking of Homewood, coach Kevin Tubbs’ team is once again one of the dominant programs in Class 6A. With a team composed mainly of freshmen and sophomores, the Lady Patriots won the state championship in 2015 and followed with a runner-up finish last year. That season-ending defeat has been a motivating factor for the team in the new season. Another plus is the return for star forward Ajah Wayne from a severe knee injury in last year’s final against LeFlore. Wayne is leading the team in scoring and is approaching full speed status. Homewood is currently ranked number two in the polls. Despite this being an exceptionally strong year for Class 6A girls basketball, the Lady Patriots are an odds-on favorite to reach their third consecutive Final Four. So as January becomes February, stay tuned. A lot of great basketball is straight ahead.